Disclaimer: Now, I do have to write in big SHOUTY capitals: DO NOT TELL THE STUDENTS THE MYSTERY WORD. You know I had to do that because one guest teacher wrote the mystery word on the board and gave them sheets of notebook paper. Even though the activity sheets were sitting.in.my.sub.binder. I just so happened to have an in-school training that day. And I walked in right as she was destroying their fun. "MRS.SPANN!!!!! SHE TOLD US THE MYSTERY WORD!!!!!" I walked over to my sub binder to make sure I had not lost my mind and forgotten to include the activity pages. Right along with a bright green sticky note that reminded her NOT to give them the sticky note. She is not invited back to be our guest teacher. 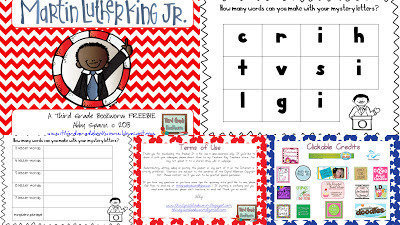 I'm sharing all of this fun with you because I just added a third mystery word/mystery phrase activity to my new MLK packet. This is the third time I've updated this packet, so if you've already purchased it make sure you go back and re-download for some extra goodies! Even sweeter, I'm sharing the third mystery word/phrase with you all! 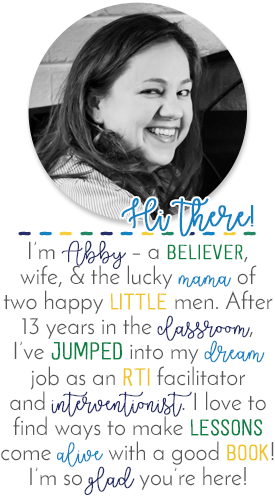 Click to snag the freebie from my TpT store! I hope you and your students will have some fun with this! If anything, it should be something fun to get you through to what I *hope* is a long weekend for everyone! I would love for you to leave a little love if it's something you can use! 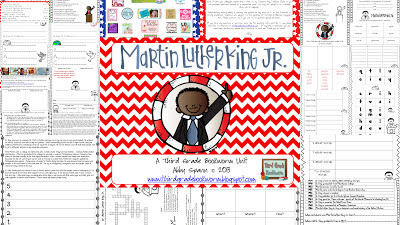 If you like it, make sure you check out the MLK packet - 25+ pages of literacy activities and printables! Click here to check out the big packet! One day down - 4 more to go! Too bad about your sub...doesn't that always happen? I had to attend a conference for FIVE days and had carefully printed everything off, stacked the teacher's manuals and papers in the order they would be used, complete with post-its giving the day/time to use them and everything. Returned, told the class to take out their work and they said they never did it. (The sub alternated between spending three days on a one day math lesson and teaching them all kinds of 'interesting' but nowhere near what they needed to learn things.) SO yeah...he will never be in my room again! With a little more morning brain power and the two word clue I figured it out!! :) Thanks everyone! My kids love these and since I'm gone tomorrow morning for a doctors appointment this will work out great!! Lisa, I was totally with you, but I figured it out! Surprised myself with that one since it's past my bedtime! Can I post it here? Don't want to ruin it for anyone else that enjoys the mystery as much as the kids do. Hint: 2-word phrase. Thanks! Can't wait to use this with my kids. Hahaha you have me laughing plus eyeballs popping out a little! Cracking up... she's not coming back, EVER! Hehe so honest and so true to how we often feel Sub plans are a pain in the you know what and when they decide to march to the beat of their own little drum it is sooo that kinds moment (she's not coming back, EVER!). On another note i must know more about this mystery word stuff your kids are loving! So off to your store I go to hunt. If I don't find it though I will be back so you can point me in the right direction :D Have a great week!